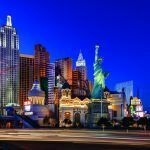 It’s the center of everything you love about Las Vegas with a distinctive New York-New York attitude! Taste an inspired portfolio of fun culinary adventures, indulge in their world-class amenities, be dazzled by one-of-a-kind attractions and let their unique entertainment lineup take your breath away. From the adrenaline-pumping rollercoaster to unforgettable nightlife, you’re going to feel the energy at New York-New York! At New York-New York, Resort Fees are ﻿﻿charged ﻿﻿$37+tax/night and are mandatory. Located in the Casino & the Mezzanine.